Mobility has been dominated by combustion engines and fuelled by oil companies. Regulation, customer demand and technological development, are pushing electricity as a mobility power source, which will inevitably impact the downstream oil business. While the traditional business model is under threat, new opportunities arise. There is still uncertainty over the potential of electric mobility and the impact it could have on certain businesses, but we have deep-dived and estimated the impact on the downstream oil business. Conditions are given for EV deployment to accelerate. EVs’ impact on refining will be highly heterogeneous among regions. Some refiners will face tighter economics since they will have to find markets further away. More shutdowns will occur in low-scale and/or low-conversion refineries. Less impacted regions will only see displacement of oil products’ imports, with minor impact on capacity utilization. There will be relative excess of gasoline due to further challenges in the demand mix. Part of this will find a market as naphtha. Gasoline will face lower spread versus diesel. New refining capacity additions will come in the form of “oil to chemicals”, limiting production in the light vehicles segment. Oil companies will struggle to retain their share of the mobility market. It is no news that electric mobility has been growing and advancing. The first commercial electric cars appeared in 2008, and their adoption rate grew slowly until recent years, when it broke the million-units-on-the-road mile, particularly due to developments in China, the US and Europe. Its increasing penetration has been encouraged by four main stakeholders: 1) government entities, which are increasingly recognizing the importance of reducing CO2 emissions and air pollution; 2) OEMs1 and equipment/service providers, which are creating/reshaping business opportunities; 3) consumers, which are witnessing their purchasing barriers eroding; and 4) infrastructure enablers, which are eyeing additional sources of revenues. As showcased by the Paris Agreement, most governments are making efforts to reduce their carbon emissions. In addition, eight major nations signed the Government Fleet Declaration in 2016, pledging to increase their shares of electric vehicles in government fleets and calling for other governments to join them. This effort goes hand-in-hand with the ambition of decarbonizing power generation by switching first coal, and then oil products, to natural gas, as well as increasing the share of alternative energy sources. Similarly, metropolises and governments have started to address concerns arising from high levels of air pollution by applying policies to reduce fossil-fuel vehicles in cities, and even announcing bans on internal combustion engine (ICE) vehicles. Overall, 14 countries have expressed intention to execute ICE bans. However, some of these bans are not pursuing a countrywide scope, and their commencements are dispersed from 2018 to 2040 so it will take some years after implementation to replace significant parts of running vehicle fleets. Car manufacturers are in a peculiar situation – they need to balance their strategies between regulatory forces and business-model opportunities. Several large OEMs have announced plans to electrify large parts of their vehicle portfolios (Volkswagen, General Motors, Renault-Mitsubishi-Nissan, among several others). In this context, new players in the value chain constantly appear to compete and get shares of the new market, stimulating investments in technology and driving costs down. A few years ago, electric vehicles were perceived as naïve means of transportation for extremely wealthy people with deep environmental concerns, and far from attractive to mass customers. An Arthur D. Little study from 2016 that included thousands of consumers in automotive core markets confirmed that the main barriers to purchasing electric vehicles were their higher prices compared to those of traditional vehicles, the limited operating range, and insufficient charging solutions. However, these obstacles are constantly eroding, and will eventually disappear. Li-ion batteries are still relatively expensive and add up to 35–40% of a vehicle’s cost. However, their cost has been decreasing exponentially. We expect the cost of EVs to reach parity with those of conventional vehicles between 2025 and 2027, and even outmatch them later on. Compared to that of oil-fueled vehicles, EVs’ autonomy range is still limited. While top-notch cars surpassing 400 miles at full charge exist, “affordable” tier vehicles (<30k USD) are still between 100 and 200 miles. 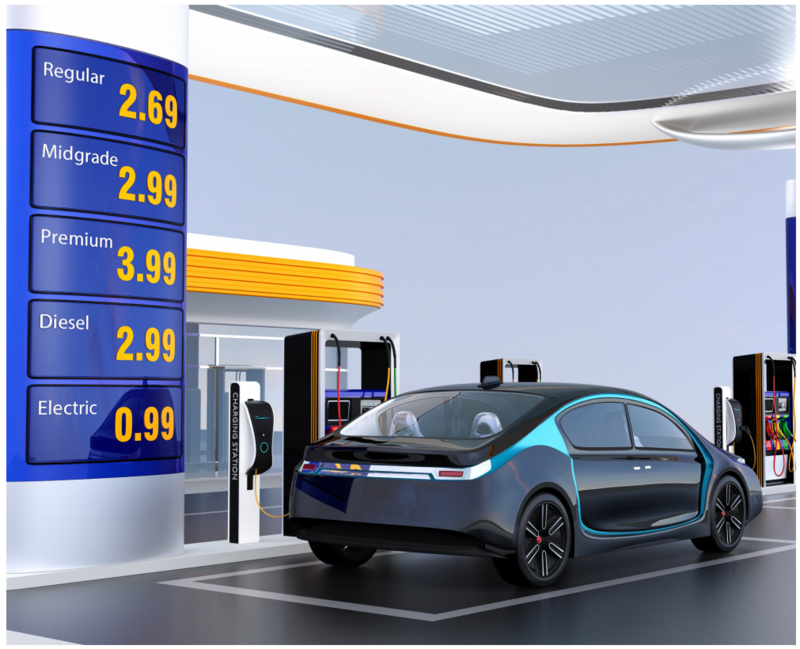 Furthermore, EVs introduce a new variable to the customer experience: charging time. Even though there are fast-charging technologies available and increasing capillarity of charging infrastructure, the charging time-autonomy range equation is still poor against fossil-fueled vehicles. Besides current fast-charging technologies come at a cost in terms of battery lifetime. However, if more powerful energy storage technologies reach commercial feasibility it can be a game-changer. Infrastructure providers are increasingly looking into EVs as a source of additional revenues and embracing the cause. Utilities are increasing their sales through EVs, as well as using them to better manage their networks. Large retailers are using charging stations to attract new customers, parking operators are adding charging services to their offerings, and highway operators could add electric charging station rights to their benefits.